5 nights in hotels and 2 nights in welcoming guest houses. Half board except on day 1 and 7. Evening meals, often based on local specialities include a starter, a main dish and a dessert. All breakfasts and 5 evening meals. This self-guided walking holiday is the first section of a wonderful & dramatic 415km crossing of the Pyrenees Mountain chain between the Atlantic and the Mediterranean following the GR10 long distance trail. You'll amble through stunning scenery that varies enormously, from flower filled meadows, sparkling lakes, cirques and high summits. You’ll get a taste of many different cultures, from the Basque country through to Catalonia. Each valley you pass through has its own distinct flavour. 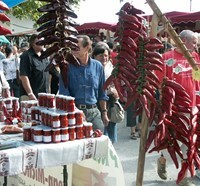 It is a great way to explore local life and to absorb the differences, the Pyrenees is a unique blend of many different cultures. This first section, from Hendaye to Saint Jean Pied de Port, covers a variety of landscapes typical of the Basque country, set in the heart of the Atlantic Pyrenees. The scenery has a charm and regional originality that you won’t find elsewhere. Rolling hills, magical villages, such as Sare, Ainhoa and Dancharia that are steeped in Basque tradition, and a rich Pyrenean flora and fauna are all waiting to be discovered. As you head deeper into the Pyrenees you will reach the villages of Bidarray and Saint Etienne de Baigorry with the sumptuous Iparla mountain ridge in the background. 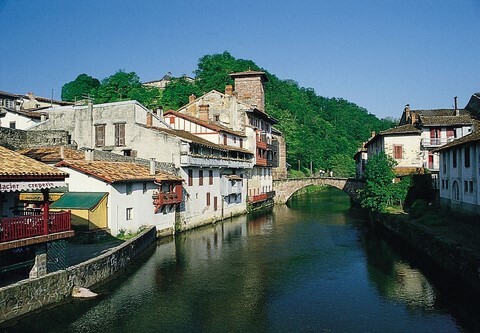 Part 1 of the GR10 ends in St Jean Pied de Port where you can explore the historic capital of Basse-Navarre. 6 days independent walking moving everyday between hotels and guest houses. It is graded moderate to challenging with average days which include 5-6 hours of walking and 725m of ascent & descent. The hardest day includes 7 hours and 30 minutes of walking and 1135m of ascent. The walking becomes harder and more mountainous as you progress. Paths are generally good and well defined, although they can be rocky and mountainous in character in places. You should have a good head for heights and be able to navigate. Depending on your arrival time, after checking into your hotel, you may choose to walk in the region of Domaine d’Abbadia. A fantastic natural site of 65 hectares situated right on the coast. You will find a great mix of landscapes, moors, prairies, heather and high cliffs. You can also visit the famouse neo-gothic chateau, the Domaine d'Abbadie. If you have more time: from St Jean de Luz, the coastal path, offers you magnificent panoramas from the port of Ciboure to Hendaye. 5.5km (2hrs), +80m, -80m or 12km (3hrs30), +200m, -200m. 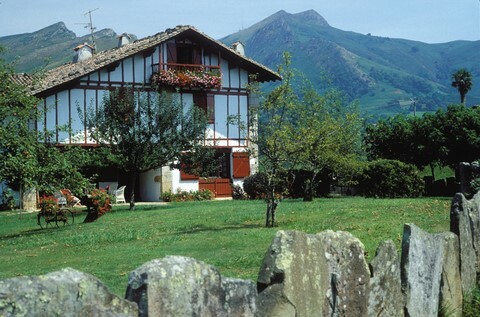 Hendaye lies on the estuary of the River Bidassoa, which forms the border with Spain. The GR10 walking route begins its course on Hendaye Plage. Rising rapidly above the Atlantic, this first stage of the walk is pleasant. The landscape, scattered with villages, is peaceful and harmonious with the rolling hillsides. The ambience is very basque but there is no sign yet of the high dramatic mountains to come. 14km (4hrs45) +730m, -345m. Short transfer (can be avoided, consult us). The first outlines of the distant mountains can be spotted on the horizon. 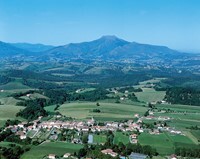 You have the chance to reach the summit of La Rhune. At an altitude of 900m it is considered the first peak in the Pyrenean chain. You'll pass picturesque villages; Sare and Ainhoa are scarcely more than single streets lined with large houses. The houses (mostly dating from the 17th century) have stone lintels carved with the dates of their construction and details of their family's history. 21.5km (6hrs45) +650m, -670m. Today the GR10 passes a series of summits, crossing over high mountain passes, it winds its way around l’Erebi (583m), and then further on l’Axulegi (617m). At the high mountain pass of col Zuccuta there is a superb viewpoint. From the col, weather permitting, you can either take the track route to the Col des Veaux or if it's fine you might choose to stay on the ridge. This is not part of the GR10 but it is well worth it for the views. The ridge leads all the way to the Pic Gorospil at 691m where there are superb panoramic views. 13km (4hrs), +670m, -200m. The GR10 continues to alternate between the Pyrenean summits and mountain villages that have a strong Basque identity. The trail heads in the direction of Col de Mehatche situated at an altitude of 716m. You'll pass into a rocky landscape that is home to griffin vultures that circle high above. You descend to Bidarray village, an emblematic overnight stop that is vibrant with the characteristic Basque culture and lifestyle. 11km (3hrs30), +270m, -740m. Today is a challenging walk and will lead you to Saint Etienne de Baigorry across some breathtaking scenery, such as extraordinary sandstone cliff faces along the classic ridge walk of the Cresta d’Iparla and its culminating peak of 1044m. 18km (7hrs30), +1135m, -1075m. This is the final day of the first week's walking on the GR10 trail leading into Saint Jean Pied de Port, in the very heart of the Basque country. There is over six hours challenging walking with 900m ascent and descent before arriving at Saint Jean Pied de Port. It lies in a picturesque setting on the banks of the river Nive, and is located on a historic route into Spain. Enclosed by walls of pinky red sandstone, the old town is pretty and interesting with a single cobbled street. Many of the historic houses bear inscriptions on the lintels from the 16th and 17th centuries. 19km (6hrs30), +900m, -900m. Your holiday ends after breakfast in Saint Jean Pied de Port. Opportunity to visit the historic capital of Basse-Navarre. 7 nights' Half Board accommodation, except two nights where it is on a B&B basis. 5 nights in hotels and 2 nights guest houses, all in double or twin rooms. Nights 1 and 7 B&B basis, nights 2 - 6 half board. Continental breakfast. Evening meals are usually local specialities and include 3 courses. Picnic lunch is not included in the price, but can be ordered from your hosts the evening before. Biarritz Parme airport (25km) : daily flights from Paris, London, Lyon, and the Clermont Ferrand. Direct UK flights from Birmingham with Flybe. By train : Many TER trains in direction Hendaye, departures from main cities. www.ter-sncf.com to confirm timetable. Departure from Saint Jean Pied de Port, bus or train SNCF, direction Bayonne. 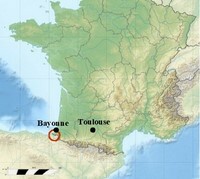 From Bayonne, possible connections to Hendaye or Biarritz. www.ter-sncf.com to confirm timetable. We recommend arriving by train to avoid returning to Hendaye to recover your car, because the return to Hendaye is long by public transport and very expensive if you take a taxi. If you have to come by car, we recommend that you leave your car in Hendaye on the first day and return by public transport because you will not be tired by a week's walking.